Our dream house actually turned up one day. We weren’t the only ones who nurtured the same dream: 16 buyers wanted it, and a “bidding war” ensued. How could we prevail against other enthusiastic bidders? The answer is Scott’s strategic thinking; he knew what would work and thus we got the house. We’re even more thrilled with it than we had hoped. The dozens of other five star reviews say pretty much the same thing—professionalism, ethics, sensitivity, deep knowledge of the market and, rather than repeat them—they’re all true--I’ll add these three: Scott routinely spotted defects and design difficulties in houses, and always pointed them out to me. I’d usually missed them, as each house is a lot to take in. Second, he could envision, architecturally, what it’d take to make a so-so house much better and what that might cost. Third, he was so fast at responding to our text messages & emails, that it became a joke: could he get his response time below 12 seconds? “I first learned of Scott from his quarterly mailing of a market analysis for Delaware County property sales. After I met with Scott and saw his portfolio I immediately knew he was the right realtor to handle the sale of my home. Scott provides a full service for selling a home. His market analysis supported the listing price and his suggested repairs meant I spent my money wisely. His advice for staging was spot on because I got great feedback from all the showings. My home was under contract in 20 days after receiving multiple offers, and it sold for over the asking price. "Approximately mid-June 2012, we began looking for a new home in Pennsylvania coinciding with my husband's change in work status. We were directed to a home in Elkins Park and the agent happened to be Scott Laughlin. That home was not for us, though as soon as my husband met Scott, he knew we had an agent. When I met Scott, I understood what Brian meant in his description of Scott as straight forward and to the point. Neither of us are fond of agents that think every home is perfect and right for any Buyer. We had particular thoughts as to what we wanted in a home. We are in a different stage of life than when we bought our home in New York fifteen years ago. Two of our children are in college and one has only two more years at home. Scott studied us and knew better than we did what we wanted and needed. He showed us homes that we chose and some that he chose. He was fair and realistic in guiding us. We came to realize we were not as centered in our thinking as we thought. Scott asked us the difficult questions and we put him through his paces. Scott has a great personality. He was cheerful early in the morning and into the evening. He never promised what he could not do and we greatly appreciated his honesty in every area. Scott was our agent, though he also became our friend. He took great care of us every step of the way. We certainly tested his stamina by looking at fifty homes before entering a house that immediately felt comfortable and livable. Scott guided us expertly throughout the buying process, His smile kept us going. Once in a while, life gets it right! As Scott will understand, our partnership was "Bashert". We would cheerfully recommend Scott to anyone as an outstanding agent. He is also a terrific photographer!" “The consummate professional, Scott Laughlin introduced himself to my husband and me years before we were ready to put our home on the market, sending us beautifully crafted electronic and printed messages about the housing market in our area. He was knowledgeable and informative, inspiring great confidence, so that when the time came for us to sell our home of 37 years, he stood out among many fine realtors who also approached us for our business. We invited him to present a proposal for selling our home and he came armed with stacks of statistics on our area and beautiful brochures he had created for other sellers. He also brought glowing testimonials from satisfied clients and clear evidence of his recent, impressive track record in home sales. Before we even listed with him he gave us a room by room assessment of our home and property in which he advised us to perform updates, de-clutter, and generally stage the house, informed by his artist’s eye and vast experience with today’s buyers. He marketed himself so compellingly to us, we could only imagine how his gift for promotion would translate into selling our home. We told him we would undertake his recommended upgrades (floor refinishing, wallpaper removal, reducing the amount of furniture) and be ready to list the following spring. In the middle of this project, my husband became terminally ill and died, leaving me to carry on the work of staging the house and listing it for sale by myself. Two months after my husband’s death, I contacted Scott and said I would like to execute our plan to sell. He was exceptionally helpful in walking me through the process as a recent widow, sitting with me literally for hours as we prepared the disclosure statement, item by item. During this process, I learned that in addition to being talented expert in aesthetics (he told me where to move furniture and hang pictures to create a pleasing first impression) he was also scrupulously detail oriented regarding finances, numbers, and the legal issues associated with selling a home. His vast experience informed every conversation. Once our home went on the market, the market became dismally and unexpectedly quiet, resulting in many months with very few showings and lukewarm interest in a home and property Scott so lovingly presented with beautiful descriptive copy and photographs in printed brochures, postcards and electronic media. Scott was discouraged and somewhat mystified by the unexpected downturn in the market in our neighborhood. He worked hard to speculate what the reasons were and did not give up. After nine months on the market with very little activity and one abysmally low offer, and despite several open houses, interest started to pick up. I wrote a companion piece to his formal brochure, a message to prospective buyers titled “Beyond What You Can See” about the intangibles of the neighborhood and community, schools, services, culture and people who made our street unique. Scott encouraged me to write even more, creating a “story” that would touch the buyer’s heart, reminding me that I could write things that realtors were not allowed to talk about. The day I put the new and improved essay out on the dining room table, two prospective buyers came through and wanted the house, badly. A coincidence? Maybe. I received two offers in the same day. Scott presented each one to me, patiently reviewing every detail of each offer including likelihood of qualifying for a mortgage, terms regarding the home inspection, mortgage commitment dates, settlement dates, etc. He helped me to weigh the relative risks and advantages of each offer in addition to the bottom line price. This was delicate work. I watched him encourage me to consider every aspect of each offer without trying to influence me one way or another. There was an extremely time consuming 48 hours in which both buyers considered and responded to my counters offers. Scott worked around the clock to keep both offers alive so that I could choose the best one, working with each of the buyer’s realtors, communicating openly and honestly with each and making each one aware there was another offer on the table. It is here that Scott’s solid ethical stance shone through. He was all business, calm, patient and thorough. “Scott Laughlin was the best realtor that I could have asked for. He was both extremely professional and caring. I was selling my home of 56 years and had to do so within two months since I was relocating to Virginia. Scott ensured that my house was brought up to code and recommended very reputable contractors to assist in this process. His expert knowledge and handling of my sale alleviated a lot of potential stress for me. I would highly recommend Scott to anyone both buying or selling a home. “Scott is an outstanding agent -- smart, knowledgeable, ethical, patient, and relentless on behalf of his clients' interests. I cannot recommend him highly enough, and will send friends and clients to him without reservation. “Knowing the relationship Scott established with some of our neighbors while selling their houses, made choosing him to sell our home a natural. His knowledge of the architect who designed our home and of our little historic community was important to us, and it was so evident in the way he marketed our house. Scott guided us before putting our house on the market, helping us to see what updates were imperative, what things a new owner would prefer to do, and showing us just how to stage our home. Scott has an artist's eye, and his photography of our home is beautiful. Since so many home buyers are now using the Internet to research available properties, Scott created a website just for our house, complete with photos, video, floor plan, a map of the neighborhood, and a darn near poetic description. I fell in love with our house all over again, seeing what Scott had done. “We found Scott through a search of historic home web sites and magazines since we were only interested in purchasing an historic property. We gave him our wish list: built before 1850, two acre minimum, ninety minutes from the Philadelphia International Airport, and move-in condition. All for a certain price. Scott went above and beyond his required duties, as he drove us through 6 counties over a period of 8 months. So much time, in fact, that we were beginning to feel guilty. He did a great job representing us during all phases of the purchase: negotiations, inspections, financing, and closing. His knowledge of the profession put us at ease; we knew that he was looking out for us, always pointing out important issues with a property and finding comparable homes in the area. When we wanted to offer a certain price, he suggested coming in lower and that lower price was accepted. Scott is the epitome of a buyer's agent. It was obvious that he has been working in this field for awhile, as his support network is excellent and very professional, especially the people used during the home inspections. We were extremely satisfied with that service. “Scott managed every step of the buying/selling process with great skill and understanding for the client (me). I was downsizing from a large home that was quite atypical for it's neighborhood, and it could have been difficult to sell. Scott marketed the house in a way that targeted the right kind of potential buyers, which resulted in a sale within a few weeks. He also provided excellent advice in the buying process. Throughout the entire process he was always available to answer questions or make suggestions. As a result, everything went smoothly. "Scott is an extremely professional and knowledgeable real estate agent. His extensive knowledge of older houses as well as the neighborhoods in the greater Philadelphia area was tremendously helpful to us as he helped us narrow down our choices by spending the time to first determine our needs and then patiently finding suitable properties. Scott is not only well informed but he is truly experienced and easily guided us through the house buying process. He provided us with easy to understand descriptions on issues, items, deadlines and deliveries at every point in the process, in addition to giving clear guidance on insurance, mortgage, neighborhood character, contract information and so on. In summary, Scott is truly familiar with the historic houses in the Philadelphia area and brings both professional enthusiasm and careful preparation to good use. He professionally steers the home buyer through the buying process making sure that all deadlines are met, that contract terms were satisfactorily explained, inspections coordinated and all documents carefully and professionally reviewed. We could not have asked for a better agent and are extremely happy with Scott and our new house. Scott is a true professional." "We used Scott to sell our home in 2010 and found him to be extremely helpful and knowledgeable. He suggested ways to de-clutter our home to make it more presentable, took excellent photos, provided guidance in evaluating offers, advised us what changes/upgrades were advisable and managed our expectations effectively. As an active community member, Scott was in a good position to sell our location. He responded quickly to emails and phone calls. I highly recommend Scott to anyone looking to buy or sell a home." "You are a master of what you do, and you've been an even better friend - if that is possible. You've made what could have been an overwhelming experience into a wonderful and enlightening experience. As a wheelchair user, I had very specific need and requirements for my home; flat lot, open layout, easy entrances and egress, safe and attractive neighborhood, proximity to my Son's school, shopping, etc. Scott's knowledge of his service areas is so thorough that it narrowed our search considerably and saved time. His design sensibilities are excellent and he is able to envision what alterations are possible and their approximate costs. Although this house needed only some minor adaptations, Scott negotiated the changes into the purchase price with appropriate safeguards should the adaptations not meet expectations. The same is true for negotiating the sensitive time table between securing funds and developing a timeline for inspections, settlement dates, etc. Hi business ethics are beyond reproach. He is smart, articulate and his interpersonal skills enable him to communicate with all parties of the transaction in a friendly and congenial way. He always returned calls, emails and produced required documents immediately. I felt completely secure knowing that all my concerns were represented and addressed. In short, purchasing this home was as close to being painless as buying a home could ever be!" "Scott was terrific to work with when we were looking for a new home. He took all of our requirements into consideration. He provided valuable input into the pros and cons of different properties, both in how a particular property would meet our specific needs and in how different features could affect resale value in the future. I think we ended up with a great house at a great price, which only happened because he was constantly "on the lookout" for properties for us and caught one just as it came on the market. We are very happy with our purchase and the the help & support that Scott provided." “I have just seen your email to Vladimir yesterday; your creative writing skills and photography definitely deserve an A+ ! We all want to see our homes portrayed as exceptional, our lifestyles as enviable, but most of all we want our listing agent to be passionate and tough when it comes to ''chatting up'' any negatives expressed by buyers'' agents. This is the reason that we need a gifted communicator like you to be present during inspections; you have so much information and so many positive answers for buyers, it would be a shame to have a buyers'' agent dilute your words. ''The pen is mightier than the sword,'' Edward George Earl Lytton. "Selling my home in the fall of 2006 shouldn't have been this easy, but I was smart enough or lucky enough to have hired Scott Laughlin as my Realtor. From his first visit I thought we were a perfect fit and I was right. Starting with his amazing photographs to his enthusiasm and excellent taste in beautifully showcasing my home to its best advantage. I felt I was in good hands. But most importantly for a worrier like myself, he was a comfort and support when I needed it most, and always eased my concerns with a touch of much needed perspective and humor...I will always have the fond memories of Chestnut Hill and my humble home... thanks in part to the experience of selling that home with the help of Scott." "I just wanted to drop you a note to let you know that we had a wonderful experience dealing with Scott Laughlin... He came to us with a definite strategy and he was very responsive to our needs. In addition to being personable, Scott was very professional and knowledgeable in every aspect of the process. It was a pleasure doing business with him and we would give him a strong recommendation." "We found out we were very lucky to have chosen Scott Laughlin to be in charge of selling our home at.... He was never late for all our appointments, always looked neat & great and was always very pleasant to talk to. We appreciated all of his wonderful pictures of the house. He even made me my own envelope of pictures, inside & out, to bring with me when I moved to Normandy Farm Estates. When things didn't seem to be going quickly, he always found another new solution to our problems & he was always local. He was always very respectful to me, in all he did for us." "I have known Scott for close to 20 years. We chose him to assist us to list our house in Philadelphia in the Spring of 2011. He is very professional. He told us how to stage our house. Then he came in and took fabulous pictures of our home. He made a beautiful color booklet to market our home. The house sold in 3 days! I really believe it was Scott's creative work that helped us sell the house. I would recommend Scott highly." “When we were relocating some years ago, our old realtor said, "You don't have to do anything to sell your house" and told us to list it at a high price. That realtor also just took us to see MLS listings that we found. We fired her and hired Scott. He said, "You can't sell your house like this, you have to fix the porch and paint it, and do a few other things. Plus, you've priced it way too high." He found us the perfect house, and it's one we never would have found -- nor would any other agent have found it. Back to selling our house. The market was lousy at the time. Even though we painted the porch, etc. and reduced the price, all we got was a couple lowball offers. If we had sold at that time we'd have taken a big loss. Scott recommended we rent the house and wait for the market to rebound. We didn't want to be landlords, but Scott explained it to us, and we became landlords. A few years later, we sold the house -- the market had rebounded nicely -- and we avoided the big loss, plus we got nice rental income. Between the rental income and the market rebound, we made out nicely. When it was time to sell, we called Scott. Scott could have made more money years ago by encouraging us to cut the price and sell the house; he'd have had his commission then. But he passed up that easy money because he knew that renting would be better for us. Not to say that being a landlord is fun, but it was certainly worth the money. “Scott provided several good options in great neighborhoods and patiently went through each home with me, pointing out the good and the bad, as opposed to trying to sell every single place we looked at. Once I picked the home I liked best he worked very quickly to put in my offer. Additionally, once I had the home Scott had contacts for every home improvement I was looking to do from painters, to floor refinishers, to tree stump removers, etc. I was able to quickly get my home in great shape with Scott's help. Since then Scott has stayed in contact via emails and holiday cards and after five years Scott recently visited my home to help me consider the pros and cons of some remodeling I'm considering, plus offering up several great ideas I hadn't thought of as well as providing me with yet another contact…. the architect I'll need to lay out the changes I'm looking for. “Scott Laughlin helped us find our dream home...and it wasn't even for sale!! He also helped us sell our house..in 4 days with multiple offers! He is a true professional. He was always available and followed up on every little detail. He helped us prepare our house for sale giving us staging advice and his photography skills captured the beauty of our home in a way that almost made us want to stay! It is rare to find such a truly honest and dedicated person who is so passionate about what they do. “Scott was excellent! 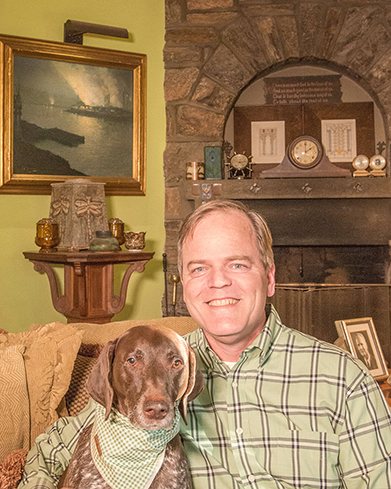 His "niche" is historic homes, and he came through with flying colors for my husband and I. Scott is not your typical real estate agent, look around, put on market, hopefully sell house... NO!!!! Scott spent many hours with us advising on the market, the correct listing price for our home, addressed items to be repaired BEFORE we listed the house, etc. All very helpful and extremely important. He was always available when we needed him for questions, he always showed up on time, and worked very hard to show our house and get it sold. “We were aware of Scott's expertise in real estate and his local knowledge of the market from having read his monthly property analyses. So when it came time to sell, we contacted him to be our agent. We were not disappointed! From the first contact he walked us through the process with great skill and compassion. The compassion part was important because there were a lot of bumps in the road (at least to us) and he was like a shock absorber keeping things moving forward at all times. It was like he didn't have other clients and we were his primary concern. This included lots of personal attention because we were traveling a lot and there was a need for things to be checked on at the house with all the storms this winter. “Moving from one home to another is troublesome, but then add doing it from Miami to Philly and you just open a can of ugly worms. Lucky for us we found Scott from the internet and could not be happier with everything. We contacted Scott from his amazing web page he created for the house we purchased. Before arriving into Philly he kept us advised of all new listings and updates on current ones. Since we only had a few days in the city, he planned out a schedule, enabling us to see the most houses in a small period of time. In the end, it was the first house I viewed online with his web site that we ultimately purchased. Guess I was already sold. Scott helped throughout the entire process meeting inspectors, roofers and repairmen as we were back in Florida trying to sell our home. Must say, everything went extremely well, all due to his expertise in his industry of real estate. “Scott is our realtor. Over the years, he has helped us purchase two homes and sell one. Scott is the expert on unique and historic homes. If you are looking for something outside the normal cookie cutter house, something with character and history, he is the realtor to hire. He navigated us through a difficult home purchase - it could have easily fallen through a few times if it were not for his experience and connections. Scott is also an experienced professional at marketing your home to sell. He took gorgeous photos of our home and marketed it expertly through both traditional and social channels. Our house sold in three days! His commitment to his clients goes beyond the sale and purchase experiences. Scott has helped us connect with contractors and make home improvement decisions through the years. He is also a pretty fun guy to hang out with! “Scott is without question the best real estate agent in the greater Philadelphia region. Professional, informed, dedicated, responsive, helpful and unbelievably hard-working...Do NOT contact him unless you REALLY want to sell your house. He will get it sold. Ours was gone in 8 days! He is known in the industry for his beautiful picture taking and marketing. His extensive knowledge and appreciation of our area's older homes is invaluable. He will be a strong advocate for you and your family and is in no way a salesman. He has a genuine desire to see his clients happy and in the right home. He is straightforward, thorough and trustworthy. “Most friendly and personable, Scott is a consummate professional who brings an unrivaled passion to his work. His thorough knowledge of the area and the existing market allowed him to help us to properly and successfully price our property for a quick sale. He was superb in helping us "stage" our house without the necessity to use an outside service, and with his expertise as a photographer he produced a stunning set of pictures to show off our house. As we prepared our house for sale, Scott's keen eye and knowledge allowed him to find things that even a subsequent house inspection missed! During the course of our work with him, we found Scott to be extremely responsive and available, principled and honest in everything he did, wise and thoughtful in his counsel, and, when necessary, a firm and effective negotiator. “We have worked with a fair number of realtors over the years and Scott is by far the best. We first worked with Scott several years ago when we purchased a 200-year old house in Chestnut Hill. During that process we were particularly impressed with Scott’s ability to spot potential problems that we would otherwise have missed. In the case of at least one house, the issues he pointed out were a major factor in our decision not to make an offer on a house that, in retrospect, was clearly the wrong house for us. And, in the case of the house we bought, it enabled us to purchase the house with a clearer picture of the issues one faces with an older house. Recently we have worked with Scott to purchase a Center City condo. He seemed just as knowledgeable in that area as well and helped us quickly narrow our choices in that market. With both purchases, he carefully followed up with the many parties involved (inspector, other agent, mortgage broker, insurance agent) to ensure that all details were in order prior to closing. As a result, in both sales, there were no problems and no surprises. We would definitely recommend Scott.’ Nate & Meghan V. – Elkins Park “Scott was an awesome advocate for us throughout the entire process and was essential to help us deal with the highs and lows of home buying. We have been working with Scott since January, and he provided expert knowledge to answer all of our questions. He was able to match our interests with available homes on the market. “Scott Laughlin is a brilliant agent. From the very beginning he was professional, gracious, knowledgeable -- wise, even -- and endlessly helpful. His honest advice at the very start about what we would need to do to prepare the house for listing was modest but exactly right. Indeed, his honesty is one of his great gifts. His suggestions about pricing arose from wide experience. In every decision he gave us good advice, but he also left us quite free. His photographs were beautifully done, as was the brochure he prepared. Throughout the process he was always available for our questions, either answering right away or calling or emailing back nearly immediately.